Starting this weekend, a synod of selected bishops in Rome will meet over a couple of weeks to debate with the prince of their college, Pope Francis, to discuss marriage and family life. Although we, as Catholics, are confident that the Holy Spirit will always guard Mother Church from error, we should never cease to pray to Almighty God, that He will guide our bishops, our apostles, along the path that He wants to lead us. In these days, in particular, when the western world has surrendered itself to the internet, luxury and aimless change for its own sake, we would do well to ask Almighty God to help us see beyond short-term remedies, which serve only to do much more harm than good, and instead to discover fresh expressions of our timeless and changeless Catholic Faith. So, as the bishops meet in Rome this month, please remember to pray for them. 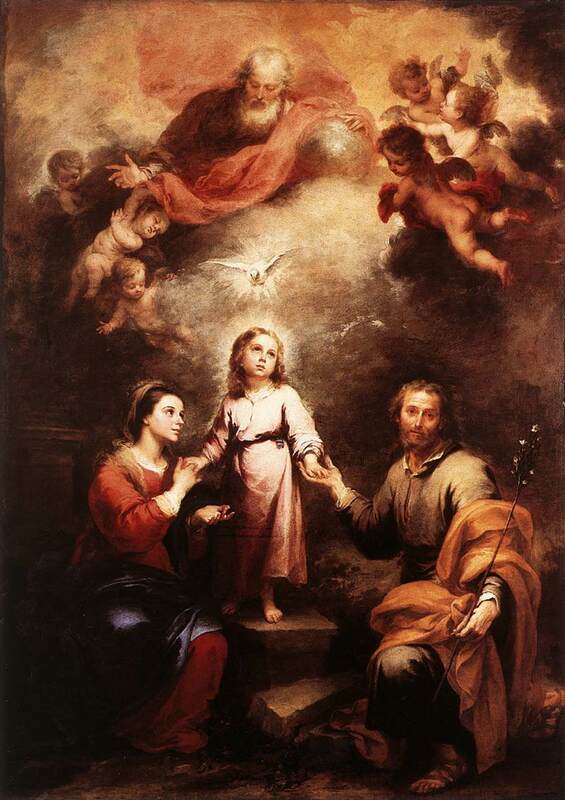 Turn especially to St Joseph, who is both patron of the Universal Church, and head of the Holy Family; ask St Joseph to intercede for the Pope and the bishops, and for the media, and for those both within and without the Church, who will be listening vary carefully to what the synod talks about. Most of all, pray for those families which have broken down, and for those living in painful circumstances as a result. Most powerful Patriarch St. Joseph, Patron of the Universal Church, which has always invoked thee in anxiety and trouble, from the exalted seat of thy glory cast a loving glance upon the whole Catholic world. Let thy fatherly heart be touched at the sight of the Mystical Spouse and the Vicar of Christ overwhelmed with sorrow and persecuted by powerful enemies. Oh, by the bitter anguish thou didst experience upon earth, dry the tears of the venerable Pontiff, defend him, comfort him, intercede for him with the Giver of peace and charity, that, all adversity being removed and all error dissipated, the entire Church may serve God in perfect liberty. Amen. O glorious St. Joseph, thou who hast power to render possible even things which are considered impossible, come to our aid in our present trouble and distress. Take this important and difficult affair under thy particular protection, that it may end happily. O dear St. Joseph, all our confidence is in thee. let it not be said that we would invoke thee in vain; and since thou art so powerful with Jesus and Mary. Show that thy goodness equals thy power. Amen. St. Joseph, friend of the Sacred Heart, pray for us. In these three Hearts I place my trust. When St John Paul visited the UK in 1982, part of his journey included the celebration of the sacraments in various different places. In York, that ancient and venerable capital of the north, he spoke most eloquently about the sacrament of marriage. The Bishops’ Conference of England and Wales has put a recording of part of his sermon in their website that you can listen to by clicking here. If you would like to read the whole sermon, click here. Perhaps even you might like to read his Apostolic Exhortation, Familaris Consortio, on marriage and family life.